South Florida has a new express train service. Here’s what you need to know about riding the Brightline train. The Brightline trains are modern, sleek-looking and run on bio-diesel fuel. The West Palm Beach station is downtown West Palm within easy walking distance of shops and restaurants. We were on board the Brightline express train on our way from West Palm Beach to Fort Lauderdale, Florida. Yes, it’s a train, but a more modern version of this a 19th-century mode of travel. When the ride was over, I didn’t want to get off the train. When was the last time you said that about a mode of transportation? 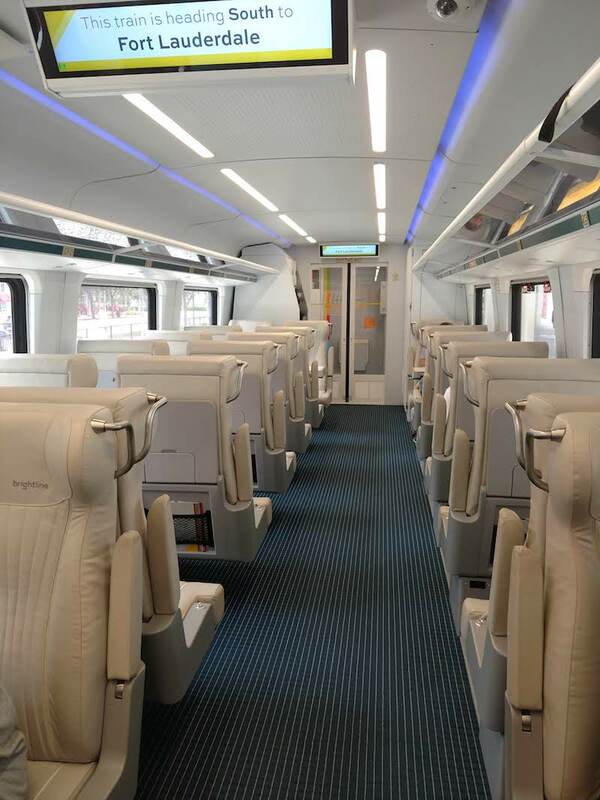 If your travel plans include going to south Florida, here’s what you need to know about this new train system. 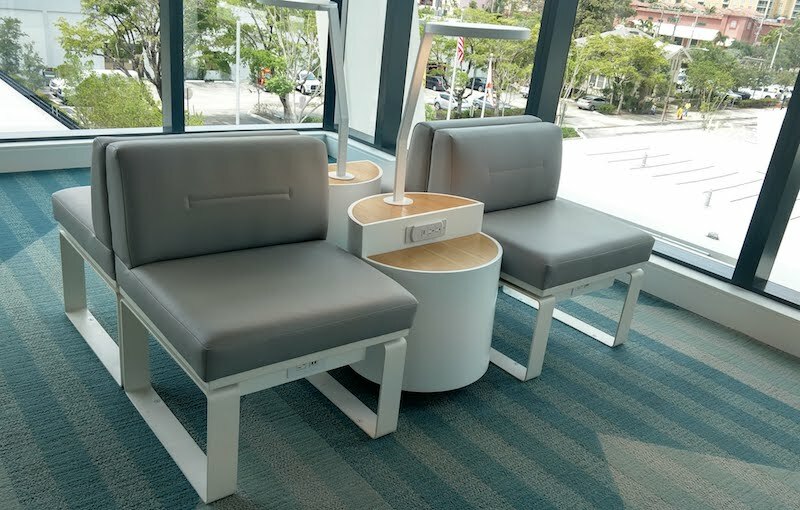 Chairs with a tablet, lamp and outlets at the Brighline station. The Brightline stations we visited – West Palm Beach and Fort Lauderdale – were bright, airy and modern. You can purchase your own ticket at a kiosk, but there were several agents waiting to assist us if we needed it. You can also purchase tickets online and by using the Brightline app. There are no change fees on tickets, although you may need to pay the difference if your new ticket is more expensive. The main level of the West Palm Beach station also has restrooms and a few tables. We then took the escalator up and after scanning our tickets on a turnstile, went through security, a simple process that felt much less invasive than at the airport. We put our bags on a belt, much like the airport, but then just walked through two parallel bars. Jarvis A. King, the station manager, was giving us a tour and told us these bars can take images if we had any metal on us. The security on the trains employs the latest in technology and is designed to move passengers through quickly. 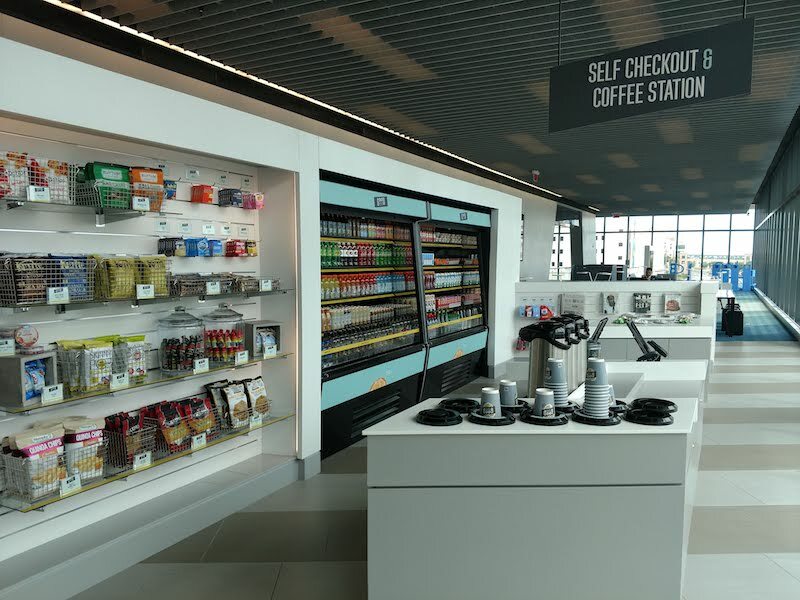 Post-security you’ll find a snack bar and a separate well-stocked area for quick self-serve items. On the opposite side is a small wall of Brightline-related merchandise. There were dozens of chairs with tons of outlets for recharging. Floor-to-ceiling windows allowed in plenty of light while providing views of the surrounding streets. 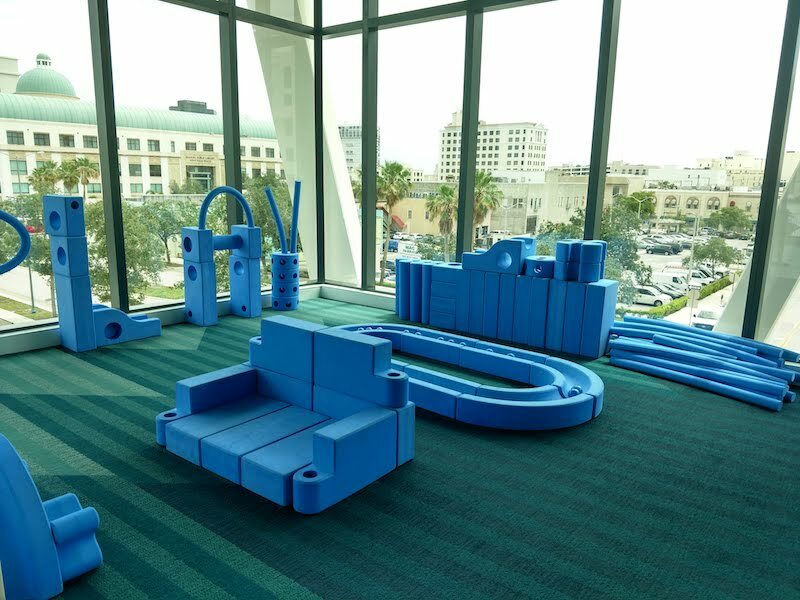 Every station has a kids’ play area with huge and various shapes of dark blue foam pieces, suitable for construction and clobbering your siblings without leaving any bruises. With a Select ticket you get access to a lounge with a separate entrance through a turnstile. It has a TV, desk for working and free snacks that included drinks, chips and Luna bars. 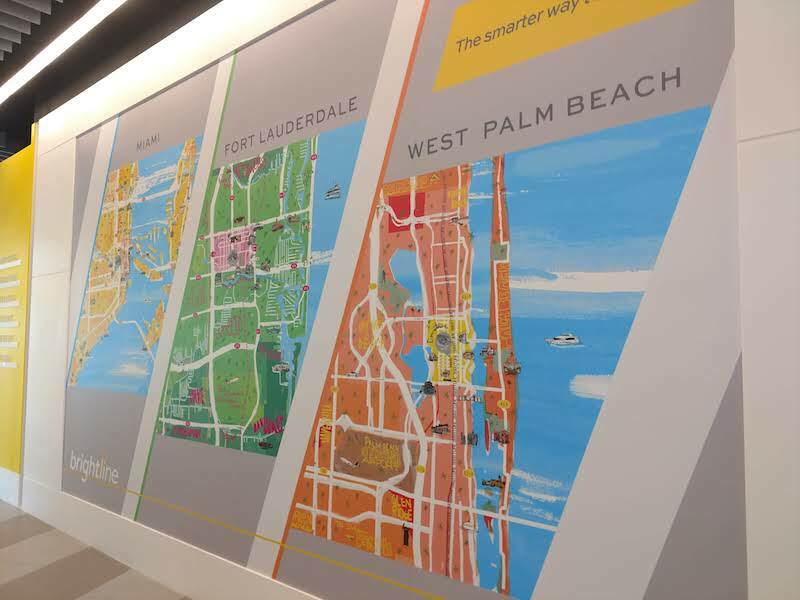 The art in the station included fun map illustrations of the areas surrounding each of the cities where Brightline has stations. 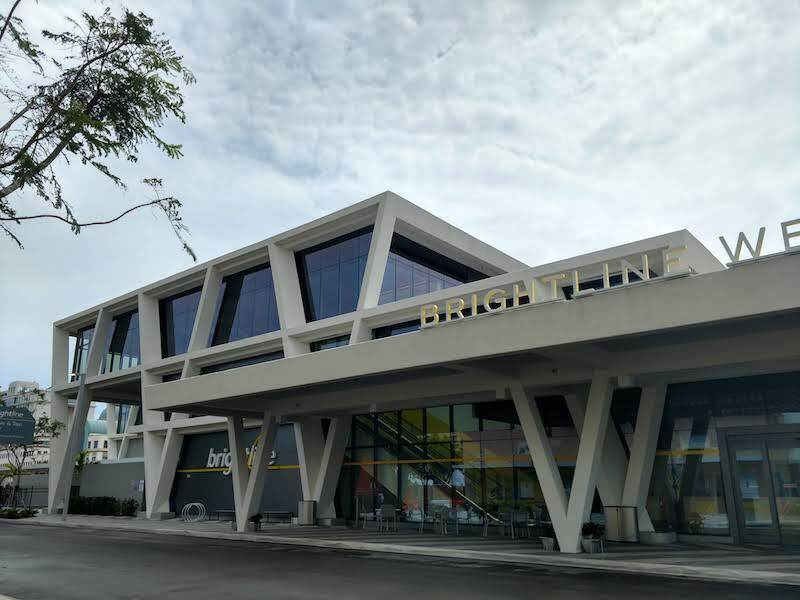 The first passengers rode a Brightline train in January, 2018, traveling from Fort Lauderdale to West Palm Beach. The third station, in Miami, just opened in mid-May. The Orlando station is scheduled to open sometime in 2020. Unlike the current routes, where existing railroad tracks could be used, the Orlando route requires adding around 170 miles of new track. These maps in the Brightline station show local places of interest. 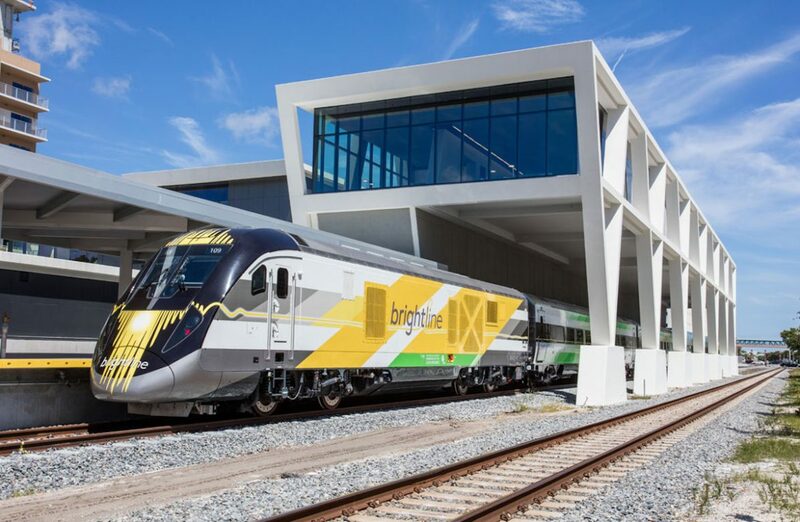 Brightline is privately owned, the only private railroad company in the country, and is being developed by All Aboard Florida, a subsidiary of Florida East Coast Industries. After this first phase of development is complete, the company hopes to expand into other areas. How about coming to Georgia, Brightline? Maybe a train from Atlanta to Athens and Chattanooga? Here’s more good news about these trains – they run on clean high-quality, biodiesel fuel. Each train has four coaches and two locomotives, seating about 240 passengers. 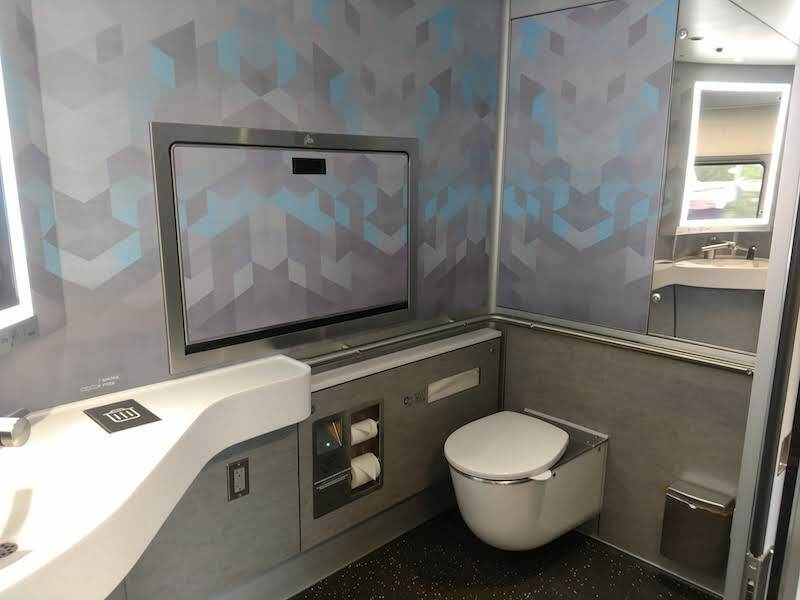 Brightline trains are fully ADA-accessible and claim to be the only trains in the country that are. There’s plenty of storage for bikes and luggage, although oversize bags need to be checked. Yes, pets are allowed, both in carriers and as checked luggage based on availability, with size and weight restrictions. They only allow dogs and cats, so leave your ferrets, pigs and iguanas at home. The trains have free high-speed wifi, which worked really well during our trip. My husband had some work to finish so he got connected right away and spent the short trip on his computer, while I was kept busy staring out the window at the passing south Florida scenery. There were only four other people in our car, however, so I don’t know how well the wifi will function when full. Continue reading for more about the onboard experience. An announcement is made to board the train, which we did by going down an escalator and walking straight on the train, which is level with the platform. We made our way to our assigned seat in the Select car. Every seat has its own outlet and tray table. There’s also the option to get seats facing each over with a table. After storing our luggage overhead, we settled in and the train took off right on time. As we left the station I marveled at how quiet the train is – no loud clanking, chugging noises you hear with traditional trains. Snacks and drinks are available for purchase in the Smart cars; our Select seats meant we had complimentary food and beverage. 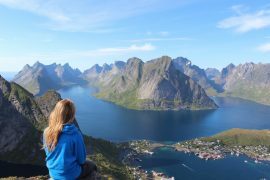 Had we been traveling after 3:00 p.m. on a weekday, or 11 a.m. on a weekend that would have included one free alcoholic beverage. As our trip was at 12, I opted for sparkling water and Skinny Pop popcorn. 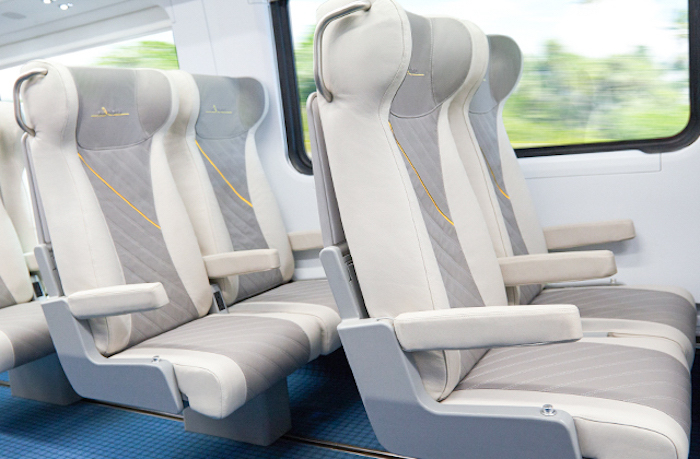 The seats on Brightline trains are comfortable, with a tray table and outlet at every seat. We did ask our attendant how she would be able to get to everyone in the car when it was full when a trip is only 40 minutes, and she expressed optimism that with a bit of help she could do it. You are also allowed to bring your own food and non-alcoholic drinks onboard. 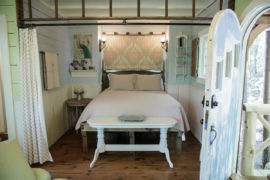 Another pleasant surprise was the bathroom. After easily navigating down the wide aisle, it took me a minute to figure out how to access it. The bathrooms are designed to be virtually touchless, so there’s a lot of waving your hands to make things happen, including opening and closing the door and even flushing the toilet. And the bathroom is big – probably three times the size of an airport bathroom. The bathrooms onboard are large and virtually touchless. To flush the toilet, you wave your hand in front of the green dot next to the toilet paper. The sink features one of those fancy Dyson all-in-one faucets – it has soap, water and a dryer all in one piece. My issue was I kept drying my hands before I could get them wet, but I eventually figured it out. The aisles are wide enough to navigate easily. Brightline trains are ADA-accessible. in Fort Lauderdale, Las Olas Boulevard is 1.6 miles away. Icons for methods of transportation available at the station are also included, for example buses, ride shares, trolleys and car rental services. We were told there was trolley service at the Fort Lauderdale station that will take you anywhere within a two-mile radius., but apparently it only runs on weekends. The West Palm Beach station we traveled from had a few bikes shares right outside and they are coming soon to the Fort Lauderdale station. There is parking available at the stations. For now, it’s free as an introductory offer. The trains run every day: you view the schedule here. Group discounts are available for at least 16 people. Special introductory fares are just $10, with other special offers available. You’ll soon be able to save money by purchasing packs of one-way rides or passes with unlimited rides. 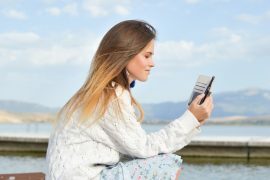 Download the app for more information. 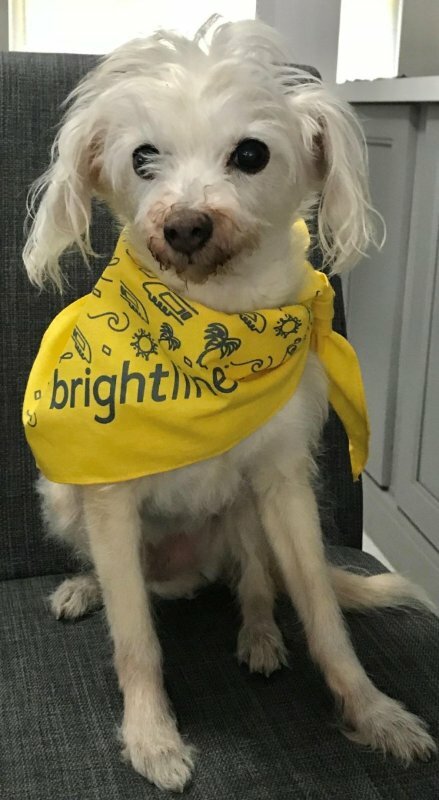 Riding the Brightline train is an experience in itself. Two couples on our train rode down to Fort Lauderdale to spend a few hours before returning, as it’s possible to easily make day trips.